Bruce Willis & Demi Moore’s daughter Scout Larue, 19 complete with the full Willis entourage in tow out together on Saturday night at the Crillons debutante ball in Paris. 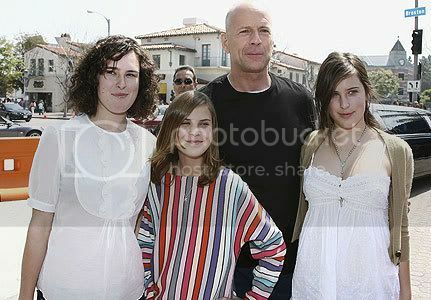 Scout Willis was one of the 24 girls presented as an initiation into womanhood. The Ball, which is held at the Hôtel de Crillon, is a glamorous elite affair, where young ladies from all over the world fancy up in couture dresses and make their debuts as women. Not sure why she had to "come out" – guess any excuse for a fancy dress up. Ashton Kutcher and Demi Moore Over Kaballah?